This picture from the PM's FB made me smile. 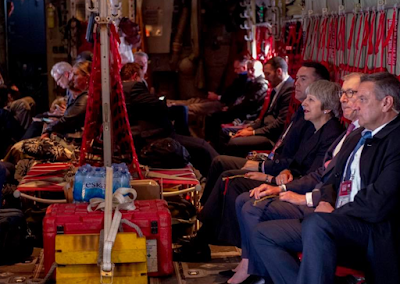 It is of herself plus several suits in the back of a Hercules military transport aircraft in Canada although, their not being strapped in, one can't tell whether it's before the beast was actually airborne, or after. From the healthy pink tinge and placid looks on their faces, I'm guessing it hasn't taken off yet. Because here's the thing. Flying in the back of a Herc is, for the first-timer, a seriously unsettling experience for the skull and, errrr, the stomach. So much so that it is usual to have a big plastic dustbin lashed down in the centre of the floor ... with a small circle of ashen-faced victims worshipping at its orifice. When the Iron Lady journeyed thus to the Falklands it was in the comfort of a specially fitted-out, vibration-limiting portacabin in the hold. It doesn't seem Mrs May gets the benefit of such considerate treatment - or maybe she has an even more robust constitution. Respect! Many moons ago I was in charge of a small section en route to a big field deployment. My outfit were (we liked to think) among the better educated of the soldiery and we used to deploy in very small numbers, attached to bigger formations. We were destined to fly by Herc, and so we had gone through the usual ritual: turn up at a large airfield in Wiltshire one evening: bed down wearing full kit in a gigantic hangar arranged with row upon row of bunks resembling a nightmare version of the field hospital at Scutari: roused at 4 a.m. for a hearty, greasy breakfast, and then out onto the pan. Boarding the Herc - the five of us - we couldn't but notice it was just us and the RAF loadmasters in the back (capacity about 90 seated troops). Guessing that they wouldn't be putting on this flight just for us, we enquired and were told we were headed for Glasgow where we would be picking up a company of Scottish infantry, Heaven help us. The flight north, at low-ish altitude on a clear dark autumn morning, was magical: we were allowed to wander around in the back (avoiding the dustbin - I had flown in Hercs many times before and was by now inured, greasy breakfast and all) and gaze out of the bubble-glass observation windows. There was a short turnaround delay at Glasgow and we were told to wait in the ordinary civilian departure lounge, where we made ourselves comfortable with coffees etc. Then, in came the jock infantry, and took their seats in serried unsmiling lines. I became aware of a bristling figure marching towards me, so I stood up to greet whatever message was coming my way. Surr! Yurr meyn! They're ... READING NEWSPAPURRS !! One of the lessons of life is that it's just too easy, and not at all clever, to be sarcastic to children and irate NCOs. And so, surpressing the obvious urge to reply, yes sarntmajor, we need to be able to read in our unit - I said we'd be sure to clear up after ourselves. The dustbin was well-utilised on the next stage of the journey. But not by the soft Sassenach newspaper-readers. When I was at 9 Sig Regt (EW) in '76 to '78 one of the infoantry battalions was 1 Para and we got to know some of them quite well. One of them who used to drink with us would complete the Telegraph crossword over a pint every lunchtime, without fail. I saw a Hercules perform at an airshow. It swooped down and did a steep, short landing and deployed a group of Royal Marines who proceded to complete an attack on the airfield buildings. 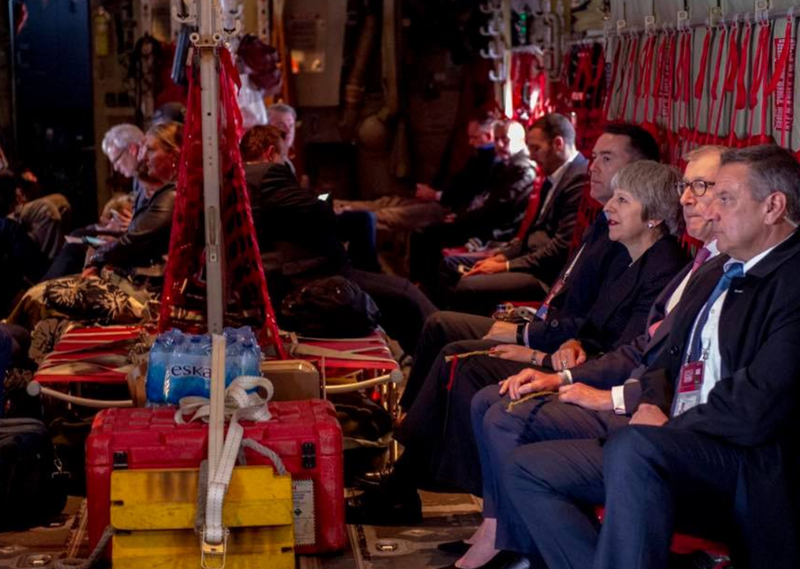 My one thought was how that landing must have felt and just how the hell none of them were puking their guts up. Kev - amazing to relate but you can get used to it. I certainly prayed at the dustbin first time out. But on a later occasion I was in a Herc which was doing a sequence of 'touch-and-go' landings, i.e. practising a sudden abort. It was appalling on the body (and, I should imagine, the airframe): but by then the stomach was OK! Sorry, this is completely off topic but it needs to be publicised far and wide. It's about half an hour long and demonstrates depths of depravity that our swamp dwellers have sunk to. To really appreciate the Hercules, you need to have been in one when it carried out a tactical landing whilst you are sitting in the turret of a scorpion tank. As a school party we visited an 'Oberon' class sub docked at Ipswich (maths master was an ex sub commander) and despite being warned not to touch anything, we surreptitiouly flicked switches and turned handles and valves as we crawled through her. One of my 11 yo companions nicked a matelot's 'Mayfair' (for the articles, natch). She sank at moorings the following week. The following year, the annual Bentwaters USAF airbase show featured a C-130 open for inspection. In at the tail ramp, out through the cockpit door. The two guards / guides were distracted in conversation at the entry to the flight deck, so we had the opportunity to flick switches, turn dials and so on for several minutes before we were stopped. The EADT reported later that an engine had caught fire on take-off and she had to make an emergency re-landing. After that my Mum banned me from boarding military vehicles. Yay to Raeder's mum! Cheers Nick. How apt! Fake picture of a fake PM. "To really appreciate the Hercules, you need to have been in one when it carried out a tactical landing whilst you are sitting in the turret of a scorpion tank. Now that is a real 'half crown- sixpence' experience"